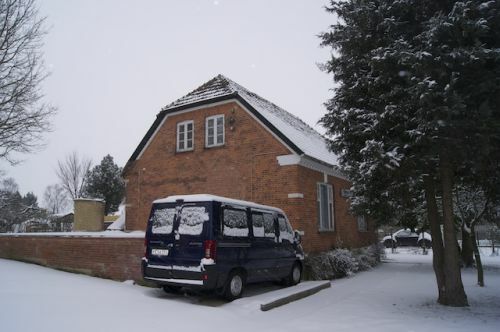 WatThaiDenmarkBrahmavihara was founded since 12th October 1990 with the cooperation from Thais who live in nearby countries such as Sweden, Norway, Germany and so on. 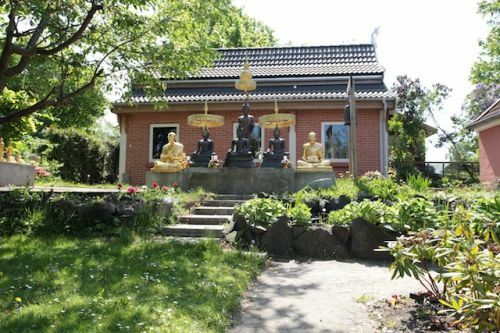 Initially, people assembled together as Buddhist Community in Denmark to establish “Wat” ( Buddhist Monastery ) to be the place for Thais to get together and perform religious functions. The initial fund was only 8,000 Danish Krone from Thai-Danish Society (Sawasdee Thai). The budget was used for arranging Thai cultural and traditional Buddhist functions. Within 3 years, the budget had expanded to 200,000 Danish Krone and they agreed to set up the proper place for the temple. Under the supervision of Supreme Sangha Council of Thailand, His Holiness Somdet Phra Bhuddachariya ( at that time his title was PhraBrahmagunabhorn ) the abbot of WatSraket had suggested Phrasoodthibongse Soodthiwungso from WatPhrakraisi Bangkok to be the leader of Dhammaduta monks to help people for establishing WatThai. 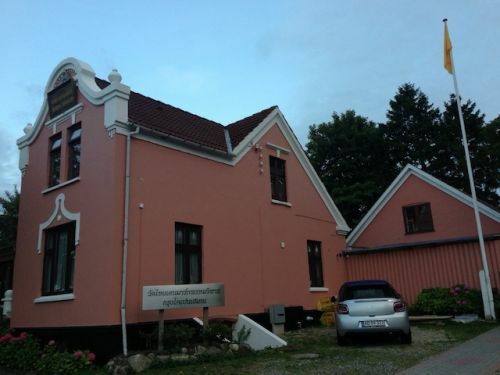 The great support from Ganløse Lion Club and Stenløse commune made this project successful. Once the Dhammaduta monk arrived, it was not easy as they expected. The place was not ready yet and nothing can be utilized for the project. However, they still continued the project by delegating work to each group in Thai community. 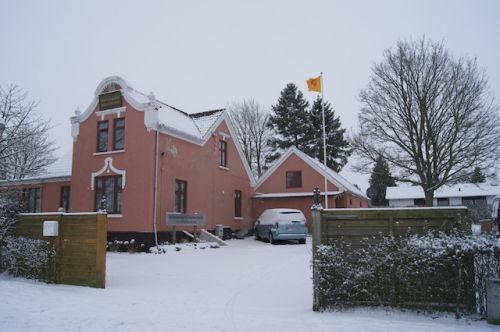 As the first generation of the Dhammaduta monk in Denmark, they had faced a lot of difficulties. Not only lack of liquidity but also separated groups of Thais were main problems. But they could still achieve the goal by having WatThai for Buddhist community. One of the remarkable team which has been helping the temple are group of teenagers. Most of them did not come from a perfect family but with Metta ( Loving-kindness ) from the monks the temple became their second home. By having such a very strong team, the ownership of the property was transferred to the temple and they had paid back the loan in full amount within 3 years. On 1st July 1991, with official visitation of His Holiness Somdet Phra Bhuddachariya and his group from Thailand, the fist Uposatha hall ( Consecrated assembly hall ) was set up. The full setting up process and religious ceremony were done by his holiness and 14 highly respected Thai monks on the next day. Later on, the hall was extended and renovated to celebrate the 60th anniversary of HM the King Bhumibol Adulyadej of Thailand accession to the throne. His Excellency Mr. Chaisiri Anaman, Ambassador of Thailand in Copenhagen, had requested for the permission to use the logo of the 60th anniversary of HM the King Bhumibol Adulyadej of Thailand accession to the throne celebration at the temple and the permission was granted on 22nd June 2006. Even though, Buddhist monastery is considered as non profit organization but it still needs the budget to run due to all fixed expenses. So public relation is one of the strategy for fund raising. By having the support from Lok Thip, one of the most popular Buddhist magazine in Thailand, it became a channel to present news, events and activities which became very interesting for Thai who live in abroad. Charity concert or football match of Thai teenagers who live in many countries are the activities that motivate fund raising campaign. Even now, it is still not enough and many sources such as bank loan have been sought. To commemorate KrubaBrahma Brahmacakko and His Holiness Somdet Phra Bhuddachariya( his former title was PhraBrahmagunabhorn ) , the name of the temple was changed from WatThaiDenmark to WatThaiDenmarkBrahmavihara, Buddhist Monastery. It is located 27 kilometers away from the center of the city. The transportations to the temple are very comfortable both train and car. The land was purchased to expand the temple and Our boundary also was re-measured resulting more land in our property. 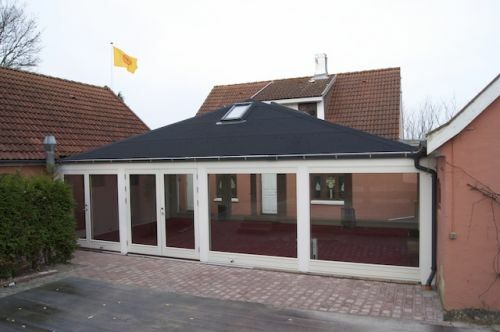 It is altogether 2115 square meters. Our ecclesiastical properties are 5 building which divided into Consecrated assembly hall, Monk resident, lay follower resident, library and canteen. In 2004, Royal annual robe presentation from HM the King Bhumibol Adulyadej of Thailand was given to the temple by the petition of His Excellency Mr. Adisak Bhanupong, Ambassador of Thailand in Copenhagen. In 2005, 2006. 2007 and 2008 Royal annual robe presentation from HM the King Bhumibol Adulyadej of Thailand was given to the temple by the petition of His Excellency Mr. Chaisiri Anaman, Ambassador of Thailand in Copenhagen. In 2009, Royal annual robe presentation from HM the King Bhumibol Adulyadej of Thailand was given to the temple by the petition of Her Excellency Mrs. Cholchineepan Chiranond, Ambassador of Thailand in Copenhagen. On 3 July 2007, Her Royal Highness Soamsavali had visited WatThaiDenmarkBrahmavihara to preside over the opening ceremony of “The Celebrations On Auspicious Occasion Of His Majesty The King's 80th Birthday Anniversary 5th December 2007”. In 1997, Phra Robert Dhammanandho who is an English monk and very acquainted with us contacted . He went Iceland for his study. Further on he had an opportunity to set up Buddhist community and meditation center but facing with many problems from Thai community. The Dhammaduta ( Phra Ajan Kasem ) was sent from WatThaiDenmarkBrahmavihara to help and continue the project. Phramaha Prasit Sirindharo ( his current title is PhrakruVidesSiridham ) was sent to be a project manger for setting up WatThai in Iceland. 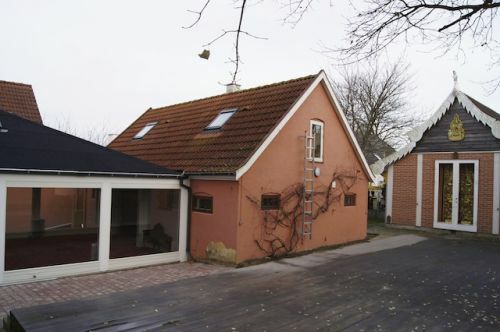 To be the second home to unite Thai who live in Denmark and neighbor countries. 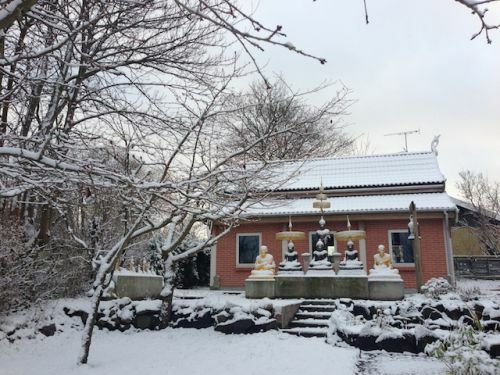 To be the place to study Buddhism and Thai tradition and culture for everyone. To be ecclesiastical center of functions and meditation for everyone. To be the place for Thai to have further study.